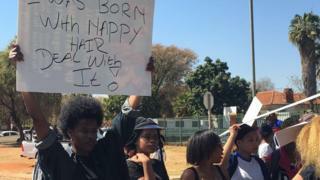 A South African minister has thrown his support behind protesting female students, who accuse their high school of operating a racist hair policy. Black pupils at the Pretoria Girls High say they have often been told to straighten their hair. "Schools should not be used as a platform to discourage students from embracing their African identity," Arts and Culture Minister Nathi Mthethwa tweeted in support. What does hair have to do with being African? The school's code of conduct has a detailed list of rules about hair, but does not specifically mention the afro hairstyle, which some pupils say they are banned from having. The minister also criticised the school over student complaints that they had been warned not to speak to each other in their own languages. "It is unacceptable to ban students from speaking their African languages at school", he wrote on Twitter. "This is about our identity as black people. We're tired of being told to be less than what we are so we can fit in," one of the protesters told me. The reports of alleged racism at the school have resonated across the country. South Africans, particularly young black South Africans, have been using social media in recent months to raise questions about beauty, cultural tolerance and racism here. They have been challenging what they describe as colonial standards that should have been dismantled years ago. At the heart of these protests are the high school's black students who feel like their identity, which is wrapped up in the curly strands of their hair, is deemed as inferior. White minority rule and legalised racism, known as apartheid, ended in South Africa in 1994. Pretoria Girls High was founded in 1902 as a multi-racial school, according to its website, but was a whites-only institution during the apartheid era. A petition calling for an end to racism at Pretoria High has gathered almost 15,000 signatures in 24 hours. Photos of students protesting were widely shared on social media over the weekend, including several of girls proudly sporting afros. The hashtag #StopRacismAtPretoriaGirlsHigh has been trending across the region on social media. South Africa has been hit by a spate of racism rows in 2016, often triggered by comments on social media. Is South Africa's Democratic Alliance serious about tackling racism?